Myeloid leukemias are a heterogeneous group of diseases originating from bone marrow myeloid progenitor cells. Patients with myeloid leukemias can achieve long-term survival through targeted therapy, cure after intensive chemotherapy or short-term survival because of highly chemoresistant disease. Therefore, despite the development of advanced molecular diagnostics, there is an unmet need for efficient therapy that reflects the advanced diagnostics. Although the molecular design of therapeutic agents is aimed at interacting with specific proteins identified through molecular diagnostics, the majority of therapeutic agents act on multiple protein targets. Ongoing studies on the leukemic cell proteome will probably identify a large number of new biomarkers, and the prediction of response to therapy through these markers is an interesting avenue for future personalized medicine. Mass spectrometric protein detection is a fundamental technique in clinical proteomics, and selected tools are presented, including stable isotope labeling with amino acids in cell culture (SILAC), isobaric tags for relative and absolute quantification (iTRAQ) and multiple reaction monitoring (MRM), as well as single cell determination. We suggest that protein analysis will play not only a supplementary, but also a prominent role in future molecular diagnostics, and we outline how accurate knowledge of the molecular therapeutic targets can be used to monitor therapy response. Myeloid leukemia is the result of uncontrolled clonal proliferation in the erythroid, monocytic and granulocyte lineages and their precursors, originating from hematopoietic stem cells of the bone marrow (Figure 1). It can be roughly divided into acute and chronic disease, reflecting disease development and survival if untreated (Table 1), but the World Health Organization classification of the various subsets of acute and chronic leukemia is increasingly dependent on molecular diagnostics because of the wider use of targeted therapy. allo-SCT, allogenic stem cell transplantation; AML, acute myeloid leukemia; APL, acute promyelocytic leukemia; ATRA, all-trans retinoic acid; CML, chronic myeloid leukemia; CMML, chronic myelomonocytic leukemia; TKI, tyrosine kinase inhibitor. Myeloid leukemia and normal hematopoiesis. Acute myeloid leukemia (AML; red box) is a hematological disease characterized by a block in differentiation and promotion of proliferation or survival. Recurrent genetic abnormalities include t(8;21)(q22;q22), inv(16)(p13.1q22), t(16;16)(p13.1q22), t(15;17)(q22;q21), and t(9;11)(p22;q23). 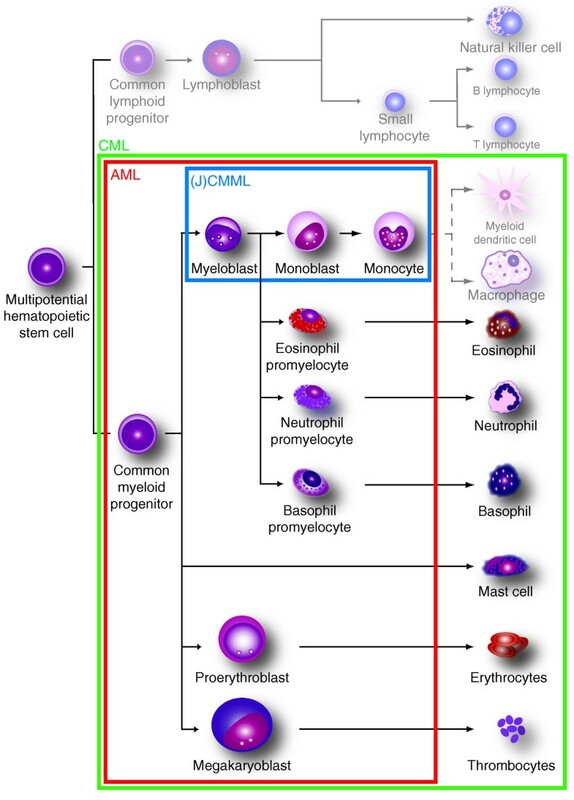 Chronic myeloid leukemia (CML; green box) is characterized as a stem cell disease with hyperplastic myeloid cells, including both immature and mature myeloid cells. The disease is defined by occurrence of the BCR-ABL fusion gene in the Philadelphia chromosome. Juvenile myelomonocytic leukemia (JCMML) and chronic myelomonocytic leukemia (CMML) (blue box) are hematological diseases with features of a myeloproliferative neoplasm and a myelodysplastic syndrome. Characteristics are peripheral blood monocytosis > 1 × 109/l, no Philadelphia chromosome or BCR-ABL fusion gene, no rearrangement of platelet-derived growth factor receptor alpha polypeptide, or platelet-derived growth factor receptor beta polypeptide, and > 20% blasts in the blood and bone marrow. The figure was kindly provided by Dr Line Wergeland, University of Bergen. Myeloid leukemia frequently involves mutations of signal transduction pathways, including mutations of the tyrosine-specific protein kinase Janus kinase 2 (JAK2) in erythroid neoplasia, the pathognomonic BCR-ABL (breakpoint cluster region-Abelson) kinase gene translocation in chronic myeloid leukemia (CML), and FMS-like tyrosine kinase 3 (FLT3) gene mutation in acute myeloid leukemia (AML) [1, 2]. All of these mutations are proposed to activate signal transduction pathways, which either belong to the wild-type kinase counterpart or, in the case of FLT3 mutation of the juxta membranous region, activate parallel signal transduction pathways that are not activated by ligand-stimulated wild-type FLT3. In AML, the FLT3 gene is mutated in more than 25% of patients, but inhibitors of FLT3 have so far not been proven to enhance overall survival. The fact that the BCR-ABL gene chimera in CML is drug-able has revolutionized the treatment of this serious disease. Overall 5-year survival in the pre-tyrosine kinase inhibitor (TKI) era was approximately 50%, compared with over 80% survival at 6 years in patients treated with imatinib . Patients usually experience tolerable side-effects that predominantly reflect the off-targets of imatinib, for example, platelet-derived growth factor receptor inhibition leading to edema. A chemical proteomic approach  has identified new protein targets for imatinib, and a similar strategy has recently been used for target validation of the broader TKI dasatinib . JAK2 is currently being explored as a therapeutic target with novel TKIs in phase II and III trials of polycythemia vera, an erythroid neoplasia . The common genetic and mutational features of myeloid leukemic cells usually imply a profound effect on protein networks of the leukemic cell. Proteomics include a collection of techniques that ideally allow the analysis of all proteins in a defined protein network within a cell, in a certain subcellular compartment or a functional part of a cell, and in a specific type of cell, organ, tissue, or extracellular fluid. Therefore, proteomics should be the ideal tool for the prediction of response to targeted therapy, as well as for monitoring targeted therapy. In this review we will focus on proteomic analysis of the leukemic cells in CML, juvenile chronic myelomonocytic leukemia (JCMML), adult chronic myelomonocytic leukemia (CMML), and AML (Figure 1), and illustrate how proteomics may create new diagnostics and molecular classifications for the disease. Current proteomic studies are clearly technology driven and research is influenced by the recent technological advances of the field. We will discuss selected methodologies that are particularly powerful for biomarker screening or the analysis of limited clinical material. The methodological pipeline to identify promising biomarkers for disease and therapy response will be discussed, as well as how recognized and verified biomarkers may be transferred into an assay format that fits the routine laboratory (Figure 2). 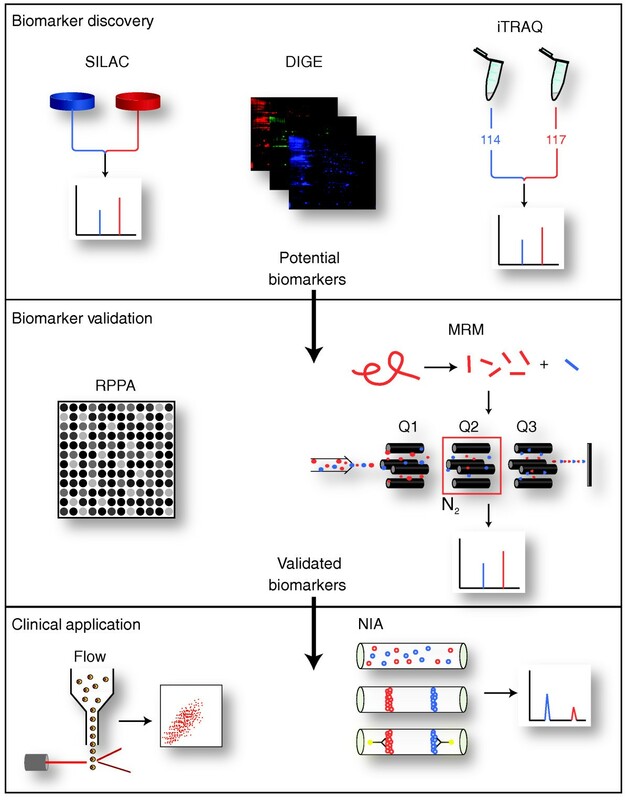 Workflow for identification, verification and application of biomarkers in clinical diagnostics. Stable isotope labeling with amino acids in cell culture (SILAC), difference gel electrophoresis (DIGE) and isobaric tags for relative and absolute quantification (iTRAQ) are all powerful tools for finding differences in protein production in separate samples. A marker is added to the samples during either the experiment or the preparation for analysis; the samples are then analyzed together and in the resulting data can be told apart on account of the different markers. The aim is to find proteins that significantly differ in expression between the samples. For further validation, reverse-phase protein array (RPPA), and especially multiple reaction monitoring (MRM), are highly sensitive methods that can detect subtle differences in production of proteins identified as potential biomarkers. RPPA is an antibody-based assay that detects and quantifies protein production. MRM allows detection and absolute quantification of protein based on internal standard peptides. A suitable peptide, fulfilling the criteria to enable optimal analysis, is chosen from within the target protein and then produced with a heavy isotope amino acid incorporated. This synthetic peptide is added in known amounts to the sample. In the triple quadruple instrument (QQQ), the peptides of interest are selected (Q1), fragmented (Q2) and the resulting target peptide ions selected (Q3) for detection. As the amount of standard peptide added to the sample is known, peak comparison allows calculation of the amount of the target protein present in the sample. To apply identified and validated biomarkers in clinical diagnostics, the analytical method must be highly reproducible. Flow cytometry is a well-established method of analyzing hematological samples. With the application of mass spectrometry detection after flow cytometry selection (ICPTOF-MS), problems with multiplexing are overcome, and this method enables detection of up to 20 biomarker proteins. The nanofluidic proteomic assay (NIA) method allows quantitative detection of protein production in very limited material. The proteins are separated according to isoelectric point inside capillary glass tubes before immobilization and antibody detection. Myeloid leukemia includes some of the most well understood malignancies in humans, but also rare and less definable diseases. CML is characterized by a massive clonal expansion of mature granulocytes and precursors. The disease progresses through three distinct phases - chronic phase, accelerated phase, and blast crisis - during which the leukemic clone progressively loses its ability to differentiate. CML has been considered to be a unique model to understand the molecular mechanisms underlying the onset and progression of a leukemic process since it was the first recognized form of cancer to have a strong association with a recurrent chromosomal abnormality. This abnormality is a reciprocal translocation between the long arms of chromosomes 9 and 22 (t(9;22)), which generates the so-called Philadelphia chromosome  (Table 1). This abnormality was later discovered to be a specific molecular defect, a hybrid BCR-ABL gene, coding for a tyrosine-specific protein kinase. The introduction into clinical practice of the first-generation TKIs - for example, imatinib - represented a major breakthrough in the era of molecular targeted therapy [8, 9]. In contrast to the relative homogeneity of CML, AML is a clinically and genetically heterogeneous disease that results from the transformation and proliferation of immature myeloid cells that suppress normal bone marrow function [10–12]. Untreated patients have a median survival of only 2 to 4 months, and intensive chemotherapy, eventually in combination with allogeneic hematopoietic stem cell transplantation, is the only possibility for cure . The first subclassification in AML was based on leukemic cell morphology and histochemistry , and was named the French-American-British system , but this classification has proved to be of limited predictive value in determining prognosis and guidance for therapy. Acute promyelocyte leukemia (APL) is an important exception, since this morphological AML variant comprises a balanced reciprocal translocation between chromosomes 15 and 17 (t(15;17))  (Table 1). Patients with APL have a particularly good prognosis after the introduction of vitamin A in the treatment  since the chimeric retinoid receptor in t(15;17) makes the leukemic cells sensitive for undergoing maturation and early cell death when treated with vitamin A. However, AML represents a heterogeneous condition, reflecting the fact that leukemic transformation can occur at different steps along the differentiation pathway. Large clinical studies have proposed cytogenetic risk systems categorizing patients with AML into three groups: favorable, intermediate, and adverse (Table 2). Nevertheless, approximately 50% of AML patients lack cytogenetic aberrations; because of this, gene expression profiles, DNA methylation patterns, microRNA expression, protein production, chemokine production, and signal transduction responses have been used in subclassification [11, 12, 15, 16]. Consequently, the treatment principle of 'one size fits all' has been challenged considerably over the past decades, even if molecular classification has been translated into highly individualized chemotherapy in clinical trials . An interesting third group of myeloid leukemia, which is difficult to fit into either the chronic or acute categories, is CMML and its pediatric variant JCMML . By definition, CMML excludes the presence of the Philadelphia chromosome, but as many as 30% to 40% of cases show different cytogenetic abnormalities. In most cases of CMML, the critical genetic lesions remain unidentified. However, the proto-oncogene family RAS seems to be of special interest. N-RAS and K-RAS are highly mutated in CMML, and recent research indicates that RAS is particularly important in the development and progression of the disease [18, 19]. The identification of proteins in cancer is predominantly performed by mass spectrometry (MS) analysis of fractionated proteins, or indirectly through probing with well-characterized antibodies. The strength of antibody-based techniques lies in their signal amplification steps, which allow the detection of protein concentrations in the femtomolar range. The combination of antibodies and isoelectric protein focusing in a capillary tube format [20, 21] allows the detection of specified proteins and their modifications with sensitivity down to 25 cells, depending on protein abundance. Certain MS methods, such as multiple reaction monitoring (MRM), are able to detect and quantify single proteins in the attomolar range [22, 23], with a dynamic range extending over three orders of magnitude [24, 25]. However, the fact that leukocytes include multiple cellular subsets requires a different technique able to distinguish between various cell types. Flow cytometric determination of blood cells using antibodies against extra- and intracellular targets provides the user with information about such cellular subsets, and represents a fundamental test in leukemia diagnostics. How can we extend the repertoire of antibodies recognizing relevant proteins in leukemia diagnostics? MS techniques such as stable isotope labeling with amino acids in cell culture (SILAC) can be used to identify new protein markers that can be developed for platforms such as flow cytometry. SILAC is a technique based on MS that has been developed to detect quantitative differences in protein levels between two or more samples  (Figure 2). Different cell populations are grown in medium containing amino acids labeled with stable light or heavy isotopes. After a certain number of doublings, the isotope-labeled amino acids are metabolically incorporated into every protein of the cell. Equal amounts of protein from the two different cell populations are combined, followed by standard procedures for sample preparation for MS analysis. The metabolic incorporation of the isotope-labeled amino acids leads to a mass shift of corresponding peptides, with the ratio of the peak intensities reflecting the relative protein amount. Until recently, the method was limited to the quantification of proteins from cultured cells. However, the development of a SILAC mouse has expanded its utilization to include differential studies of tissues and biological fluids from animal models . SILAC applications include studies of cellular signaling, post-translational modifications such as phosphorylation, and protein-protein interactions, as well as protein expression profiling in normal versus diseased cells, and identification of disease biomarkers and pharmacological targets. The method is frequently applied in mechanistic studies of drug-induced alterations of cellular signaling in different diseases, including myeloid leukemias; for example, Xiong and Wang  used SILAC to examine the mechanisms underlying the cytotoxicity and therapeutic activity of arsenic trioxide, an ancient and effective second-line drug for therapy of acute promyelocytic leukemia. Others have applied a combination of SILAC and phosphoproteomics: Pan et al. studied the effects of different kinase inhibitors on entire phosphoprotein networks, while Liang et al. quantified imatinib-induced changes in the phosphorylation of BCR-ABL kinase and its substrates in human CML cells. SILAC has also been used to study the molecular pathogenesis of myeloid leukemias, including studies of protein kinase regulation in myeloid leukemia cells compared with other cell types , and signaling induced by modulation of the FLT3 receptor tyrosine kinase in AML cells . Some of the future applications of SILAC that hold great promise include the identification of biomarkers and pharmacological targets in myeloid/lymphoid or mixed lineage leukemia comprising t(4;11) translocations compared to other types of leukemia . In summary, SILAC is a sensitive method for the study of novel signal transduction pathways and pharmacological targets, and will probably contribute to the identification of biomarkers that can be brought into clinical use. Two-dimensional electrophoresis is an effective methodology to separate proteins based on charge and size, and this protein separation technique combined with MS protein identification has already led to the successful identification of experimental therapy targets in AML [34, 35]. However, limitations in reproducibility and quantification have led to the development of the powerful two-dimensional differential gel electrophoresis (2D-DIGE) [36, 37]. Largely correcting for technical variations, 2D-DIGE multiplexes two fluorescent-labeled protein samples with an internal standard . The method improves the accuracy of protein quantification and provides highly reproducible results. It has been widely used in the discovery of disease biomarkers, treatment response and verification of disease classification. In myeloid leukemia, the accumulation of ubiquitinated proteins in the cytosol identified in the APL cell line HL-60 treated with methotrexate was found to be caused by the apoptosis-associated downregulation of structural and regulatory proteasome subunits . Shen and colleagues  used 2D-DIGE to discover the involvement of CRK-like protein (CRKL) in multidrug resistance of the CML cell line K562/ADM, thereby supporting previous findings that suggested that the protein is implicated in the pathogenesis of CML. Even though 2D-DIGE has clear limitations with respect to the representation of proteins analyzed, it allows the researcher to narrow down the number of potential protein candidates for identification and mapping of protein modification, thereby resulting in a less complex sample set to be further analyzed by MS to identify proteins with functional impact on disease. Introduced by Gygi and co-workers in 1999 , isotope-coded affinity tags (ICAT) was one of the first developments in quantitative proteomics. The reagents used are biotinylated derivates of iodoacetamide that react with the cysteine side chains of reduced and denatured proteins. Heavy and light versions of the reagents are used to label the two different samples before they are combined and digested. Streptavidin affinity chromatography excludes peptides that do not contain cysteine residues with biotin, and reduces the complexity of the sample. Before the development of cleavable ICAT [41, 42], the presence of biotin complicated the analysis due to the additional weight of the biomarker. However, cleavable ICAT allows the cleavage of biotin from the peptide before the samples are analyzed by MS. The ratio between the heavy and light peptides is used to calculate the relative abundance of the peptides before they are identified by tandem MS (MS/MS). This method has high specificity and sensitivity, and can be applied to many different kinds of samples. The obvious disadvantage with ICAT is its dependence on cysteine residues, as this excludes proteins without this amino acid. Thus far, ICAT has been used to map basic protein interactions in myeloid cell lines  and mechanisms of differentiation . Isobaric tags for relative and absolute quantification (iTRAQ) allow the analysis of up to eight separate samples simultaneously ; this is a higher level of multiplexing than that of any of the other labeling methods to date. After digestion, the peptides in the samples are labeled with an isobaric tag on the primary amines (Figure 2). The samples are then combined before MS/MS analysis. The isobaric tags consist of a charged reporter group and a neutral balance group, which are combined so the different tags have identical molecular mass. In MS analysis, the combined samples appear as a single peak, with the different reporters becoming visible after MS/MS. During fragmentation, the two reporter groups split, releasing the neutral reporter. This makes the differently charged tags visible and the intensity of these ion peaks are a measurement of the relative abundance of the peptide in the different samples. Griffiths and colleagues  used iTRAQ to explore imatinib-induced effects on the proteome in CML CD34+ cells from patients presenting with chronic phase CML. They found Asp-Glu-Ala-Asp (DEAD)-box protein 3, heat shock protein 105 kDa, and peroxiredoxin-3 to be potential markers for response to imatinib treatment . Furthermore, AML cells that produce wild-type FLT3, internal tandem duplication FLT3, or D835Y point-mutated FLT3 have been examined by iTRAQ to identify and quantify phosphotyrosines. The analysis showed differences in protein phosphorylation of JAK2, signal transducer and activator of transcription protein (STAT)5a, and SH2-containing protein phosphate (SHP1), and it was concluded that the mutations FLT-ITD and FLT3-D835Y cause divergent signal responses in AML . Reverse-phase protein array (RPPA) is a rapid, high-throughput technology for the analysis of patient samples. Originally applied to the investigation of microdissected tissue from prostate, colon, and head and neck cancer, it is also highly applicable to hematopoietic cells [48–50]. In short, cells are lysed and protein samples are spotted onto nitrocellulose-coated glass slides with an automated printer. Slides are blocked, blotted, and incubated with antibodies before measuring signal intensity by scanning and quantification of results (Figure 2). Results from RPPA have been shown to be correlated with western blotting . Tibes and colleagues  validated the method for hematological cells, proving it to be highly reproducible, even in samples as scarce as the proteomic equivalent to three cells. Kornblau and co-workers  used RPPA to propose that high levels of phosphorylation of the tumor suppressor forkhead transcription factor 3A is an unfavorable, though therapeutically targetable, prognostic factor in AML. Pigazzi and colleagues  observed that the microRNA miR-34b mediated downregulation of several target genes (for example, those encoding cyclins A1, B and D1) of cAMP response element-binding (CREB) in myeloid cell lines and bone marrow samples from pediatric AML patients, and this could possibly explain some of the cell cycle abnormalities found in myeloid cell lines. RPPA has also largely confirmed the prognostic value of Bax/Bcl-2 protein production ratio and Mcl-1 production , as previously reported by flow cytometric analysis [55, 56]. These studies show the potential for RPPA in high-throughput analysis screening for variation in protein production in large patient cohorts. An emerging strategy for the analysis of potential protein markers is the absolute quantification (AQUA) strategy used in selective reaction monitoring; this is also known as MRM [25, 57]. The high sensitivity of this method enables quantitative detection of low-abundance proteins (concentrations down to attomolar levels) in complex mixtures, with dynamic range extending over three orders of magnitude [22–25]. The AQUA strategy is based on specific detection of target proteins enabled by internal standard peptides, chosen within the target protein, and produced with a heavy isotope amino acid incorporated  (Figure 2). This selective detection of the peptides makes this method the most sensitive of all the MS methods. MRM has, to date, not been applied in studies of myeloid leukemia, but as it becomes more widespread it is natural to assume that it will take on a more prominent role as a tool for validation of biomarkers and clinical diagnostics. Flow cytometry has been used for the analysis of myeloid malignancies for several decades and its applications include classification, diagnosis and prognosis, therapy response prediction, and monitoring of therapy response. Methodological advances in the form of multiparameter flow cytometry and analysis of entire signaling networks have brought this methodology into the group of techniques available for large-scale protein studies. In 2004, the Nolan group demonstrated a novel approach for the analysis of signaling networks of cancer cells , in which they used multiparameter flow cytometry for detection of induced phosphoprotein responses at the single-cell level in AML cells. They were thereby able to correlate specific signaling profiles with genetic features and clinical outcome . The same team employed the technique to identify a specific STAT5 signaling signature in myeloid malignancies, and this correlated with specific clinical and biologic correlates . The analysis of signaling profiles at the single-cell level makes it possible to identify pathways that are activated in therapy-resistant cells, as well as potential biomarkers for patient diagnosis and prognosis. A major advantage of multiparameter flow cytometry is the small amount of material needed, making it ideal for analysis of patient samples. However, there are several limitations to the methodology, including few detection channels, spectral overlap between signals from fluorescent labels of the antibodies used, and, not least, antibody specificity and epitope blocking in a cluttered cell. Recently, limitations in multiplexing have been overcome by the utilization of element tagging of antibodies, followed by analysis using a mass cytometer, combining the principles of flow cytometry and MS . Many available stable isotopes (up to 100) can be used in the tags, enabling simultaneous detection of proteins and gene transcripts in individual cells in a quantitative manner using inductively coupled plasma time-of-flight mass spectrometry with high resolution, sensitivity, and speed of analysis. Simultaneous detection of 20 surface antigens in single-cell analysis of human leukemia cell lines and samples from patients with AML  has demonstrated the advantages of the approach, avoiding problems with detection channels, sample matrix, and stability of the experiment set-up, in addition to the modest requirements of patient material. All in all, this is a promising approach for the development of a rapid, sensitive, automated method for concomitant detection of many biomarkers in individual cells. Further development of data collection and processing, including multiparameter clustering algorithms, may provide a novel methodology for investigation of signaling pathways and disease detection. The nanofluidic proteomic assay aims to overcome the limitations in the detection of potential biomarkers in limited material [20, 21]. This method, based on isoelectric focusing of cell lysate in capillary glass tubes and detection using antibodies and chemiluminescence, can identify and quantify protein production in as little as 25 cells (Figure 2). The isoelectric separation can separate proteins with different phosphorylation states, which can provide insights into the regulation of the protein. Fan and co-workers  used this method to detect as little as 2 pg protein in a 4 nl sample, with a dynamic range of three orders of magnitude. In the K562 CML cell line, they detected changes in phosphorylation of STAT3 and STAT5, and changes in activation of caspase 3 and extracellular signal-related kinase (ERK)2 after treatment with imatinib . The obvious limitation of the method is the dependency on antibodies and the need for combination with flow-based cell sorting if cell type specificity is to be obtained; however, if these obstacles are overcome, this method can be a powerful tool in diagnostics and the monitoring of disease. Lessons from recent achievements in CML research may illustrate the future of protein-based diagnostics. CML is the single malady with apparently perfect correlation between the pathognomonic gene aberration BCR-ABL and a therapeutic kinase inhibitor that effectively inhibits ABL tyrosine kinase activity. A protein-based immunoassay for detection of the gene product BCR-ABL is in development, and will allow diagnostics of ABL-BCR-positive leukemia using cellular protein extracts or single cell flow cytometry . Future diagnosis of CML could thereby be based on protein diagnostics, using PCR-based DNA diagnostics only as confirmatory analysis. Proteomic analysis of CML cell lines treated with imatinib has revealed the modulation of several phosphoprotein targets . SILAC analysis of imatinib-treated CML cells has demonstrated a 90% reduction in phosphorylation of BCR-ABL kinase, SHIP2 and Dok-2, and other modulated proteins, including SHIP1, SH2-containing protein and Casitas B-lineage lymphoma proto-oncogene. Imatinib-treated CML cells show an attenuated activation of ERK1 and ERK2, mitogen-activated kinase-1, STAT3 and STAT5, and c-Jun N-terminal kinase . Phospho-CRKL has been proposed as a marker for monitoring patients with CML treated with imatinib and nilotinib , and may be a pseudomarker for detecting resistance against TKI treatment. Direct and indirect detection of resistance in BCR-ABL-positive CML is underscored by reports of significantly lower levels of BCR-ABL, CRKL (Tyr207) and AKT (Ser473) in resistant patients. CML may be the first disease where we achieve fully protein-based diagnostics and therapy response monitoring. Future use of protein-based diagnostics in cancer may reflect clearer the epigenetics and genome alterations in leukemia, and represent a test more directly related to the cellular protein targets of therapeutics. It is still unclear which technology platform will be the dominating workhorse in clinical proteomics, but a technology that is 'open' in terms of target selection seems to hold the strongest appeal. Maybe the lessons from modern vitamin and hormone analysis indicate a promising path [65, 66], as a high number of molecules can be identified and quantified in minute clinical samples. In diagnostics of leukemia, validated MS analysis of peptides, with high flexibility and high sensitivity, may allow determination of classification and therapeutic targets . Cell-type-specific analysis is necessary for diagnostic information in leukemia and other hematological malignancies; this analytic quality is currently provided by flow cytometry only. Detection of modified proteins in intracellular signal transduction pathways may represent a novel diagnostic tool, as exemplified in JCMML, where phospho-specific flow cytometry may replace cumbersome and time-consuming growth assays . Furthermore, protein analyses may play a role in future monitoring of therapy response evaluation, but carefully designed clinical trials will be needed to determine the role of proteomics in therapy guidance. This study was supported by grants from The Research Council of Norway National Program for Research in Functional Genomics, Helse Vest, and the Norwegian Cancer Society. All authors contributed to the writing of the manuscript and have read and approved the final manuscript.